I love making these, number one because they are so good and number two because it's fun. This would be a great weekend project for the kids. This recipe is simple, but needs to be followed quite closely. Be sure to arrange all the ingredients, before you begin preparing the dish. This should allow you to make 15 to 24 dumplings. You may freeze any leftovers that are uncooked, and the skins will keep well in the refrigerator or freezer. 1 package of Dumpling Skins. Easily found at any Asian market. ½ cup each of fresh Bean Sprouts, Bamboo Shoots and Bok Choy. All finely chopped. 8 oz of Extra Firm Tofu, crumbled. A few pulses in a small food processor is perfect. 1 inch piece of fresh Ginger, chopped very fine or grated. 1-2 Tbsp Vegetable Oil, for frying. Begin by finely chopping all of the ingredients to stuff the dumplings. The ingredients must be finely chopped so they can cook properly. Mix all dumpling ingredients and allow to sit in the fridge for at least 30 minutes. Longer is okay. Take a dumpling skin and lay it flat, then add about 1-1 1/2 tsp of filling, wet the edges of the skin with water and fold over, crimping with your finger. Set aside and continue. You may also use a dumpling press, which is easy to find at any Asian market. Make as many as you want, as they freeze very well. 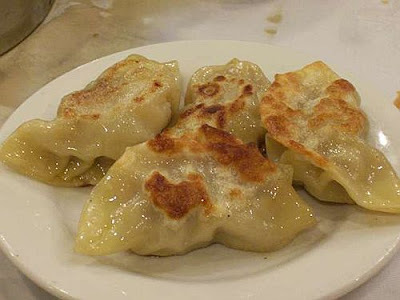 After the dumplings are stuffed, heat a non-stick pan with the oil and then add the dumplings to the hot oil, with their flat side down. Put as many in as will fit, leaving a little room for expansion. Brown the bottoms over medium heat, being sure not to burn them. Then carefully pour in 3 to 4 Tbsp. of water, quickly cover and cook on medium/low heat for 10 -15 min, or until all the water is absorbed. Remove carefully and serve with the dipping sauce and hot chili paste if desired.